I made this. I’m not really sure what to make of it. YMMV. This entry was posted in Art, Medical and tagged Architecture, Art, Cell Phone Photography, Multiple Sclerosis, Photography on January 11, 2017 by Jennifer Kaplan. I recently wrote an email to a friend I had lost contact with over the years. She knew me back in high school and a bit afterwards, but time and circumstances had conspired to allow us to lose touch with each other. These days any type of answer to the question “what have you been up to?” has to include Multiple Sclerosis. My situation in life and day-to-day experience is too wrapped up in my medical challenges to ignore. I read back the paragraph I had written and it sounded pretty ‘woe is me’ even though I was just relating facts and not commenting on how I felt about them. I added a sentence at the end of the paragraph: “On paper my life right now is pretty much a series of low points, but I’m happier now than I ever was. How unexpectedly delightful is that? !” And it is true. Being diagnosed with Multiple Sclerosis was one of the best things to ever happen to me. What a weird statement to make, right? Well, I didn’t say that having MS was a good thing. It’s not. Really, really not. If I had a magic wand and could make MS disappear I would in a heartbeat. No consideration required, it’s a “no brainer.” But the diagnosis, that is something else entirely. The summer between my junior and senior years of high school I was really sick. Not like ‘bad cold’ sick. Not even like the flu where you aren’t dying, but it sure feels like you are. No, I was really sick. I had a high fever. I was vomiting. I wasn’t so much ‘sleeping all the time’ as I was fading in and out of consciousness independent of my will. Something was wrong with my balance; I couldn’t stand up on my own. I was paralyzed on one side of my face and down my body. Most frighteningly, I was losing time. I remember being at the doctor’s office and being unable to do anything other than sit there and cry in pain. There were a lot of blood tests, but those were the only kind of tests that were done. The doctor concluded that I had probably picked up a virus, gave me a shot full of anti-biotics, and sent me home to get better. I wasn’t the sickest person in the house, so there was no one who was “together” enough to advocate for me and call the doctors out on their non-answers and when that was all we could get. And that word ‘probably’ really angers me, even now. The doctors I saw fully admitted they had no clue what was wrong, everything was ‘maybe’ or ‘if it’s this…’ There wasn’t even a suggestion of doing other tests or trying to find out what was wrong with me. The attitude seemed to be if there wasn’t an easy answer than there was no answer. And I was in no condition to argue. When school started in the fall I went back, against the doctor’s recommendation. What a bad idea. I ended up missing about half of my senior year. Eventually I got better and didn’t much think about what had been wrong with me because it was over, and I was glad. I just wanted to put it behind me, and to be honest there were other things happening in my life at the time that took over. That is when a pattern started that would continue for almost 15 years. Every few years something would go very wrong with my health. The symptoms varied each time. No doctor really looked into my past medical problems, they just focused on the current ones. I’d be really sick for a while. I’d get a diagnosis. I’d do whatever “treatment” the doctor recommended. It wouldn’t help, but then it wouldn’t matter anymore because I’d start getting better on my own. I wish I’d kept a list of every diagnosis I was given over. I know Mono was mentioned more than once. Chronic Fatigue, Epstein Barr, and Fibromyalgia each had their turn. Arthritis was also a favorite. Some doctors got really creative with their guesses. After telling me I wasn’t depressed, one doctor put me on anti-depressants. Another doctor told me that I had some rare form of bi-polar disorder where there were no mental symptoms, only physical ones. Every time it was the same deal. The symptoms, diagnoses, and doctors changed but the pattern did not. Even when I was feeling healthy I was aware there was something wrong with me, and I started living in a constant state of waiting for the other shoe to drop. And those were just the things doctors told me. Friends and family who had only the best of intentions would tell me that it was all in my head, what I really need was a good shrink. I was told it was an allergy, I needed to keep a cleaner house. I was told it was my diet, I needed to eat more vegetables. Once I was even told that I was just lazy, as though the person speaking could “tough love” me into being healthy. Some people in my life genuinely thought I making it up, or possibly I was experiencing physical symptoms because I wanted attention so badly. Once when I was really sick I asked a family member for help. At that point in time I could barely get myself dressed and to a doctor’s appointment. One specialist would refer me to another type of specialist, who would then tell me it wasn’t their field and refer me somewhere else. It was a horrible, vicious cycle and I couldn’t advocate for myself to make it stop. I called this person and explained what that I needed someone who could take me to appointments and listen to what the doctor said. I needed someone who would ask questions, and be able to remember (or just write down) what I was told from one appointment to the next. Basically I needed someone to advocate for me, to be a “grown-up” or parent. This person I asked for help then told me that the only thing they would help me do was check into a mental institution, and that if I didn’t admit this was all in my head they wouldn’t have anything to do with helping me. That story is the most blatant example of the “it’s your own fault” attitude, but it wasn’t the only time something like that happened to me. The worst part, I think, was that even though I knew something was actually, physically wrong with me I had no proof. Sometimes I’d wonder was I crazy? Did I actually need to be in a mental institution as was suggested? Was I doing this to myself? I didn’t want to be sick, I truly didn’t, but I didn’t know what was wrong so I couldn’t do anything about it except fear it. The cycle repeated. In late 2008 I started feeling really sick again. This time I had a headache worse than any other I’d ever experienced. It didn’t seem like a migraine, I’d heard what those were like and it certainly made sense since this headache wasn’t like any other I’d had. There was one specific place in my head that hurt, and it hurt worse if I looked up or to the right. Left was okay, but right was agony. I was sensitive to light. I was dizzy. I was nauseous. I stayed in bed with the shades drawn almost all the time in an effort to “sleep it off” like it was something rest could cure. I mean, that made sense, in the past when things went inexplicably wrong with me time and rest were the only things that consistently made a difference. But then a new symptom popped up, I was seeing spots in my right eye. I figured it would go away with more rest and I made an effort to keep that eye covered and use it as little as possible to let it heal. The strategy that had always worked in the past wasn’t working. I was getting weaker and less able to get my body to cooperate. Even walking down the hall to the bathroom was challenging. And I had lost all vision in my right eye. This round of whatever-it-was started not long after a very stressful personal event in my life and it kind of reinforced the whole “you are doing this to yourself” fear that had been planted so many years back. I reluctantly went to an urgent care expecting to get eye-drops or something along those lines, and another diagnosis of who-knows-what that would be meaningless and frustrating. County Hospitals are pretty bad places. They are where people go when they don’t have the resources to get medical care anywhere else. They are underfunded, understaffed, and overburdened. I experienced multiple botched tests including a botched spinal tap (ow!) and had to raise a ruckus with the nurses to get them to follow doctor’s orders. In every single instance it was a case of the hospital staff not having the training or resources to do their jobs properly, I did not experience a single instance in which I felt the employee didn’t care or was just being lazy. There were just too many patients and too few qualified people. I’m not looking to get into a political debate with anyone and these facts aren’t really relevant to this post, but I feel it is important to share them. I ended up spending almost a week in the hospital. I was lucky, I had a steady stream of friends in and out of my hospital room at all hours. People brought me books, snacks, stuffed animals, flowers, my favorite tea, anything to show me they cared and wanted to try to make things a little easier on me. They tried to explain “pain.” I told them I was already an expert. I was diagnosed with Optic Neuritis pretty quickly and given IV medication that started to restore the vision in my right eye. I never recovered my vision all the way, but in those first few days the difference was immediate. What I didn’t know, and I think the urgent care doctor and the ophthalmologist did know, was that Optic Neuritis is often a symptom of Multiple Sclerosis. MS is diagnosed by an MRI of the brain showing lesions and a Spinal Tap ruling out a number of other things. It took a few days to get the tests done, but I was finally showing MS symptoms in front of people who knew what they looked like. “Relapsing Remitting Multiple Sclerosis” fit the exact pattern I’d experienced over all those years, and finally someone realized it. I don’t remember who all was in the room when the doctor came in to give me my diagnosis. The hospital I was in was a teaching hospital so the doctors never came in without an entourage of students writing things down and quietly staring at me. I know that I had heard someone say “MS suspicions” at some point because, even though I didn’t really know anything about MS, I wasn’t surprised to hear the words. As soon as the doctor told me my first reaction was “just like President Bartlet!” which seemed to confuse the group of people in the room. I’m sure a few of the medical students wrote down “doesn’t seem to know who the president is” or something along those lines. They went from watching me like an animal in a zoo, to watching me like a crazy animal in a zoo. Even when I explained that the fictional President from the TV show The West Wing had MS I was greeted with blank stares. Oh well, can’t win ’em all. I remember a nurse coming in with papers on MS printed from the internet. Later someone came in with pamphlets from the National MS Society. (I didn’t know a diagnosis came with so much homework.) A Priest stopped in to visit me, and even offered to track down a Rabbi if I wanted. A counselor of some sort wanted to talk to me about how I was feeling. (“tired, and you?”) But the truth is that I was feeling physically battered and bruised, but emotionally… Emotionally it was good. I mean, my head still hurt like crazy and you could still sneak up on me from the right side but no one was telling me this was my fault. No one used the word “maybe” when telling me what was going on. Finally, finally I had some answers. And that made all the difference. This wasn’t something I was choosing; this wasn’t “all in my head” or any of the other things that had been suggested to me over the years. I had a name of something, something definitive. After almost 15 years of not knowing, just having the words “Multiple Sclerosis” felt like a gift. There were other people out there who had it. There were places I could go to get more information and to learn what was ahead. This is a case when the fear of not knowing is worse than anything, and I finally had the keys to unlock the information I needed. Life didn’t get easier, in fact it’s only gotten harder, but it’s gotten better. I guess the closest analogy I can think of is being hopelessly lost in a strange city, and every time you ask directions you are told to go a completely different way than the person before had told you to go. You’re going in circles, at the mercy of other people, and none of them are helping. You are spending so much energy and effort, and getting nowhere. Getting my MS diagnosis was kind of like finding the freeway. You’re not home yet, but you finally know where you are and can start figuring out where you need to go. It sounds so weird to say, but that is exactly why getting my diagnosis was one of the best things that ever happened to me. I’m not saying having MS is a good thing. Quite the opposite; on the list of ‘good things’ MS doesn’t even register. It’s a crappy, crappy disease that does its best to interrupt everything in your life and take away everything you love. Fighting that takes every bit of strength, both mental and physical, you have. But knowing you are not alone, knowing there are other people going through something similar, simply knowing it is a real thing and not in your head, these are invaluable things that were given to me along with my diagnosis. I am grateful. This entry was posted in Medical and tagged Attitude, Diagnosis, Doctors, Gratitude, Hospital, MRI, MS, Multiple Sclerosis, Optic Neuritis, Spinal Tap on December 3, 2013 by Jennifer Kaplan. Thanks to my my habit of rambling on about my life in a written form I know exactly when I first listened to Christopher Dallman. I’m not sure when I first heard his name though. I know he had been recommended to me more than once, I know he had been recommended to me by different people, and I know that the various people recommending him were all people whose musical tastes I trusted. I’m not sure who posted a link to buy his album, but at some point probably a month before that post I was buying some CDs from a website (physical CDs, remember those?) and sort of on a whim added Chris Dallman’s CD to my virtual shopping cart. I remember thinking that I should probably listen to some samples before spending money, and I remember laughing at myself for being too lazy and deciding to just buy the thing. (I rarely did this by the way, but it seemed like a pretty safe bet at the time.) I know that the CDs came in the mail and I immediately listened to whatever I had been all excited about ordering. I tossed Chris’s CD in my car, the inevitability of Los Angeles traffic making it a good place to listen to new music. I’m not sure how long the CD sat in my car before the morning I put it in the CD player. I listened to the first 30 seconds or so of each song before skipping to the next track, just so I could get a feel for what I was in for. (The musical equivalent of reading the last chapter before starting a new book. Something I do with music, but not books oddly enough.) Track 8. Over My Head. I couldn’t bring myself to hit the ‘next’ button. The song grabbed me instantly, it felt like the lyrics were speaking directly to me. I keep looking down while I climb. It feels strange to use the word ‘friendship’ in this context, but I don’t know how else to describe it. We chatted online. We weren’t the kind of friends who called each other when we were bored or hung out with each other in real life, but chatting regularly about our lives (albeit in a superficial kind of way) did bring some kind of familiarity to the situation. Maybe I was alone in this, but it certainly felt like Chris was a friend. 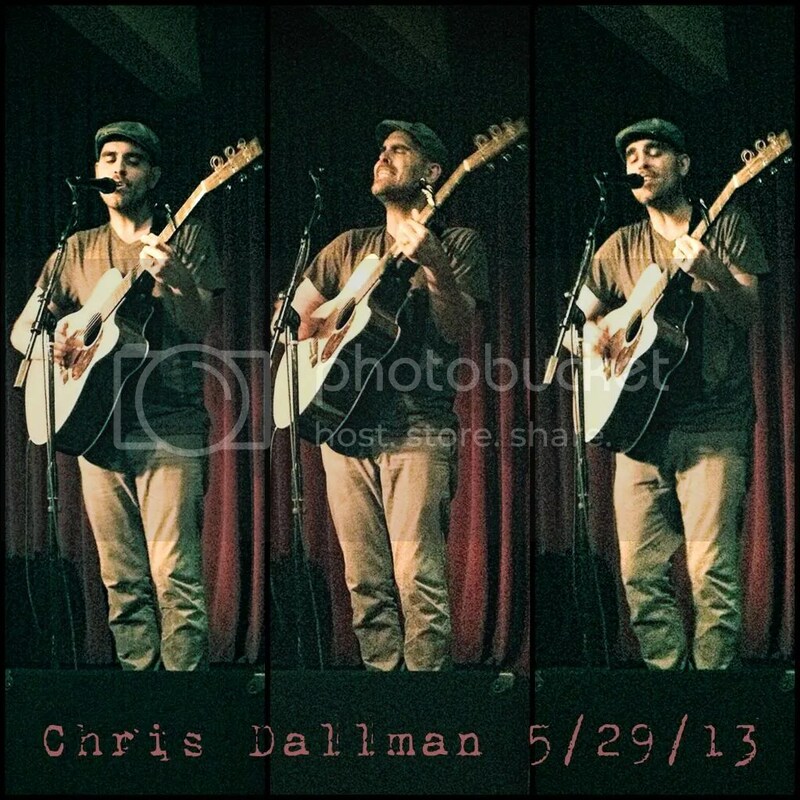 It was a gig in early November of 2009 when I first met Chris in person. I know it was a gig he did at Genghis Cohen, but somehow I didn’t journal/blog/post about it so I don’t have a lot to refer back to. It was around the release of the ‘Sad Britney’ CD (a collection of Britney Spears covers, each with Chris’s particular twist.) I remember he was surrounded as soon as he left the stage with what were obviously friends. Feeling shy, I decided not to push my way through the crowd to introduce myself, but no way was I leaving without buying the new CD. Unfortunately there seemed to be no ‘merch’ table so I had to wait until it was possible to grab Chris’s attention. Finally a small break in the crowd and I asked to buy a CD. I might have told him how much I enjoyed the set, but I didn’t introduce myself and I didn’t let him know I was one of the people he’d been interacting with online. While getting me change, Chris paused, looked me, then asked “are you bdbdb?” (My twitter name.) I was shocked he remembered my “name,” much less cared about meeting a twitter follower when so much else was going on around him at that moment. Chris smiled so brightly when I said yes. It wasn’t just me feeling this internet friendship-but-not-really-a-friendship-thing. A sort of pattern developed where Chris would play a gig, I would bootleg the gig, Chris would pretend he didn’t know I was breaking the rules, and I would share the video files with him when I was done. 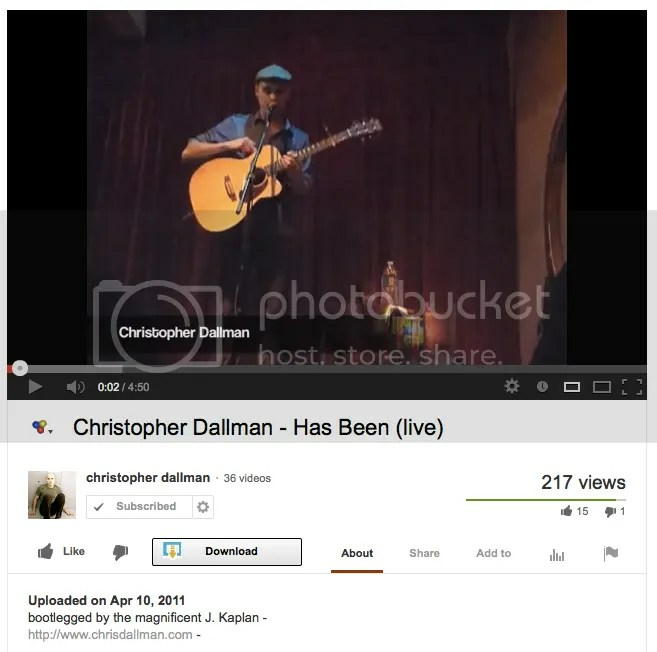 On more than one occasion he even posted my videos online. I love the music Chris makes. I think he’s got an amazing voice and is a skilled musician, but I think those two skills pale in comparison to his talent as a lyricist. I tend to collect phrases, lyrics, quotes, etc. the way some people collect stamps or spoons, and song after song I heard words that really touched me. I think those are some very powerful words and ideas. Just like my tattoos, those words speak to me on a very deep and personal level. I’m out of wrists to tattoo (I should have been an octopus!) 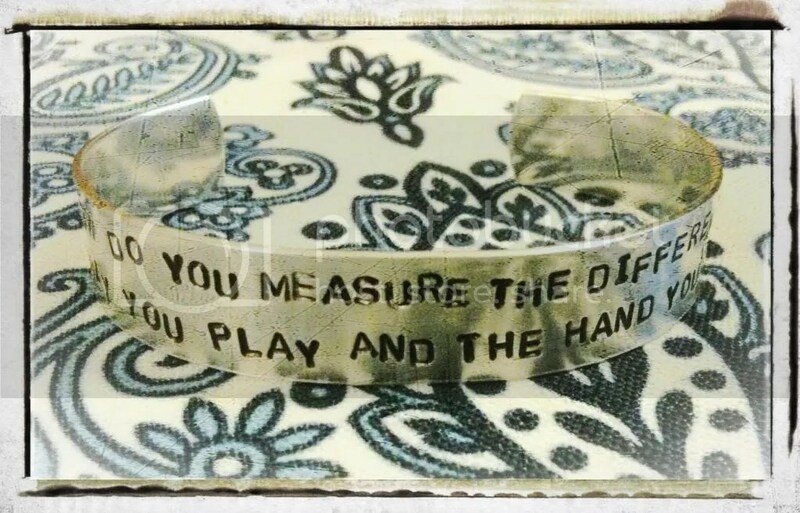 but I did come across someone who makes bracelets with sayings on them, and was very happy to make me one with song lyrics. December of 2009: I was between jobs, but even if I had been working I wasn’t at the point where my employment came with health insurance. (Long detailed explanation, has to do with the nature of the entertainment industry and being able to join the union.) I wasn’t eligible for any government assistance with my medication. The pharmaceutical company itself had a program to help low income patients, but I wasn’t eligible for that either because when I did work I made too much money. (Yeah, it makes no sense, I know. But that’s the way it is.) The medication I was going to have to stop taking was a very expensive MS drug that is supposed to slow down the progression of the disease. But it wasn’t a ‘life-saving drug.’ By this I mean I wouldn’t die if I stopped taking it, and therefore there was not a lot of places to turn for help. I was very frustrated and posted something on twitter to that effect. Chris almost instantly replied with “how much do we need to raise?” We. The implication in that one little word was kind of astounding. We. You’re not alone. We. We’re all in this together. 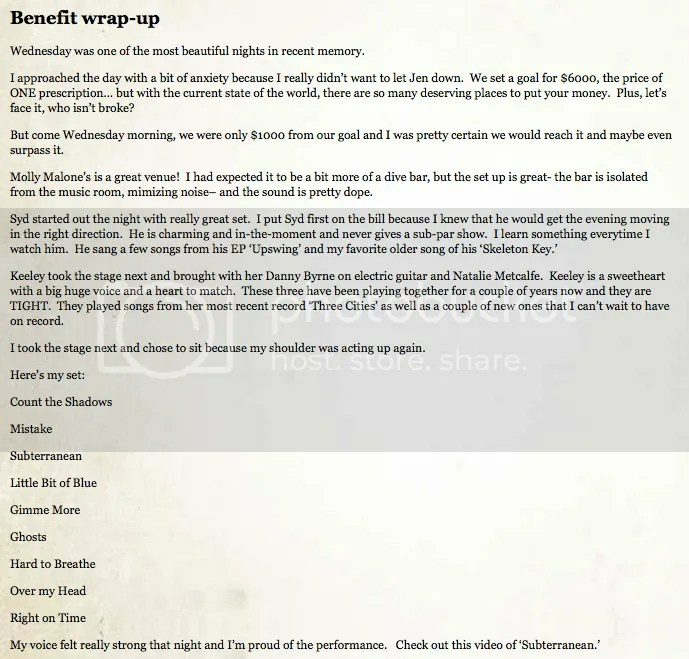 Chris came up with the idea of holding a benefit concert. He recruited his friends Keeley Valentino, Syd, and George Stanford to volunteer to perform. A venue was secured, and the concert was announced on his website and social media. I don’t know how much time and effort Chris put into making this all happen, but I know it had to have been significant. People who couldn’t come to the concert wanted to donate something. People I never would have thought of asking for help. People I knew didn’t have a whole lot of disposable income. People I knew only casually. People I didn’t know at all. So many people all came together to help me. I can’t even write about it without getting teary-eyed at the outpouring of love I was the subject of. All of those donations, large and small, added up to right around the target number even before the concert happened. The concert itself was indescribable. The music was beautiful, the room was full of smiling people, and my only worry was that I wouldn’t be able to get to everyone who came out to personally thank them. I felt so, so loved that night. It is an an experience I will treasure forever. I don’t know if I can really put this experience into words in a way that will explain what was happening in my head around then. I knew I needed money for medication, but there was something else I really needed, I just wasn’t aware of it at the time. Being told repeatedly by different organizations and agencies that they just couldn’t help you starts to take its toll after a while. Especially when they each refer you to the other to apply for help, in some sort of never-ending cycle of rejection. You start to feel that you are alone. You are powerless. There is nothing you can do. No one really cares. (People at these places would try to be helpful, it wasn’t as if they were mean or uncaring, but I was told to sell property or borrow money from family or any number of other things that were not an option for me.) You become a little resigned to the fact that you can only depend on yourself, if you can’t provide something for yourself (like medication) then you are just expected to go without… I’ve called Chris my ‘guardian angel’ on more than one occasion, but it wasn’t just the concert and money and medicine that I meant when I said that. Chris taught me that other people (people who barely know me) could be caring and giving. That sometimes I can ask for help when I need it. That no one is powerless when they are surrounded by good people. That I am not alone. It’s something so small, but so incredibly huge at the same time. That knowledge will improve my life every single day from now until I die. I sent Chris a thank you email. I gave him a thank you card. I thanked him in person. I don’t think even once was I able to articulate just how much his actions mean to me. Life continued to happen, as it does. Chris released new music which I loved. We stayed “twitter friends” and said hi at shows. As my disease has progressed I venture out into the world less and less, which makes the things I surround myself with more and more important. Chris’s beautiful music continues to be an ongoing presence in my life and source of joy. Arrangements were made. Tickets were purchased. Friends provided transportation, and sat with me in Room 5 for hours before the show since that was the only way to ensure I had a seat. (Room 5 is one of many places that has told me they don’t do anything to accommodate people with disibilites and I was on my own, but that’s a rant for a different post.) I warned my friends I might get all emotional and embarrassing during the show, but they chose to be seen with me in public anyway. I held it together pretty well, making every effort to be present in the moment and fully enjoy the experience. Until Chris started singing Over My Head, that is. It was just too “full-circle” or something for me, and I pretty much cried through the entire song. I probably got a few strange looks. And then it was over. We made our way out of the room and I hugged Chris goodbye. Just like the first meeting he was surrounded by friends wanting to celebrate with him. It’s not as if I’ll never hear his music again. It’s not as if we will stop tweeting or facebooking or social media-ing. Really nothing has changed other than the lack of live concerts. (And I have an extensive library of bootlegs I can listen to when I’m missing that.) But I left that night determined to let Chris know what his presence in my life has meant to me, what a gift he has been. This post is my attempt. I hope I was successful. You can follow Chris on twitter or subscribe to his YouTube channel or just go to his website. You can buy all of Chris’s music here or on iTunes. 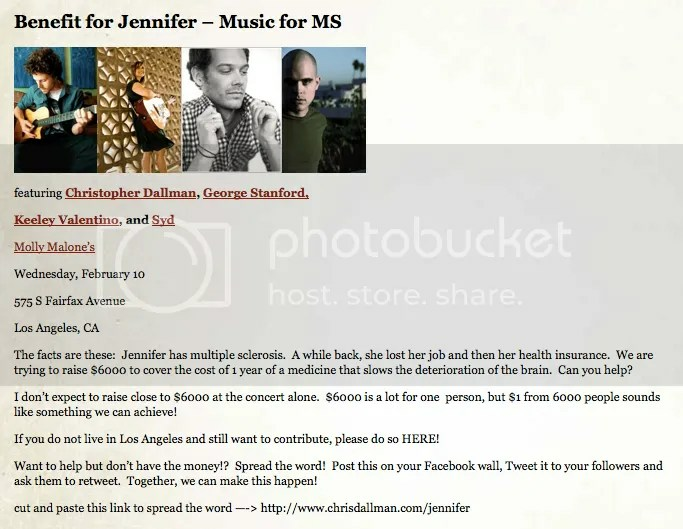 This entry was posted in Life, Medical, Reviews & Recommendations and tagged Attitude, Cell Phone Photography, Chris Dallman, Concerts, Friendship, Gratitude, Life Lessons, Love, MS, Multiple Sclerosis, Music on July 3, 2013 by Jennifer Kaplan. When you were younger did you ever write on your hands or arms? It probably tended to be something so important that it could not be allowed to be forgotten. A classmate you had a crush on finally gave you their phone number, or a homework assignment that had to be turned in. Or did you ever doodle on your binder in school or the inside-out grocery store paper bag covering a textbook? (Do not tell me if you doodled on the book itself, I don’t want to know that about you.) 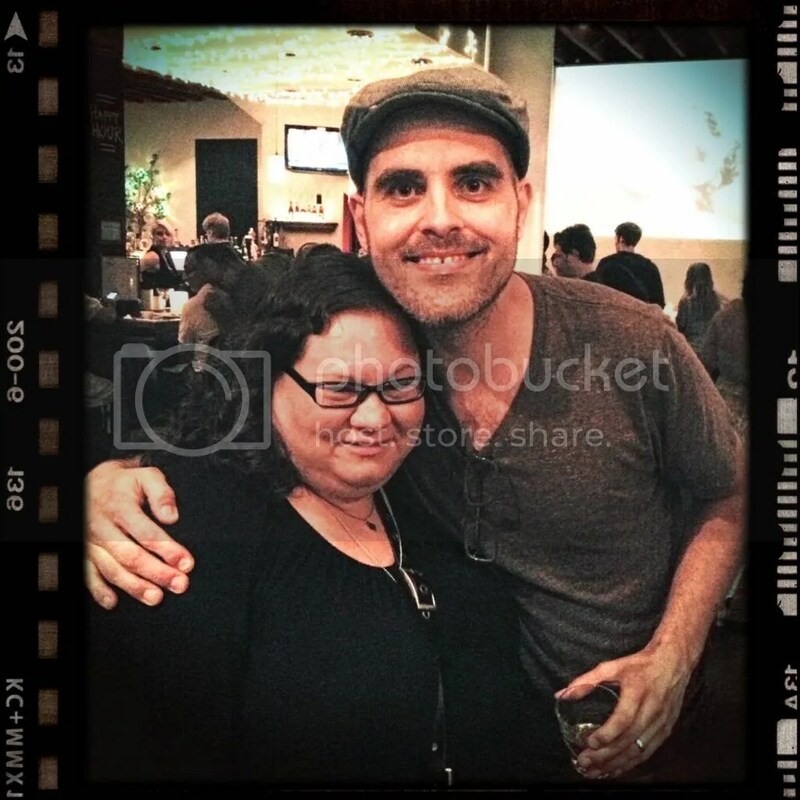 “I heart [insert name here]” or “JK + GC TLA.” (Jennifer Kaplan + George Clooney True Love Always, in case you don’t know the lingo…) Something that was just so true that it had to have a physical presence in the world. It didn’t matter that a few weeks later [insert name here] would be replaced with a new name. At the time the strength of your passionate young emotions made this statement the most important thing in the whole world. Well, it’s sort of the same thing with my tattoos. I enjoy well-done tattoos and I like people who have and appreciate them. It is art that you love so much you have it marked permanently so you can carry it with you forever. I’m not against getting a tattoo on my shoulder or back or ankle, a picture or symbol that I love enough to make permanent, but my tattoos are on my wrists. I need to get a million glimpses of them throughout the day. I need to be constantly seeing them, even if only subconsciously. It’s not really any different than writing a reminder about math homework on my arm or writing something true on my binder. Did I say sort of the same, I meant exactly the same. My tattoos are things that I know to be true, but I need to work at remembering. I’ve been wanting a tattoo for somewhere around 10 years now, but I could never decide what I wanted and where I wanted it at the same time. Well, the last two or so years I’ve known exactly what I wanted and where, but for some reason I’ve been dragging my feet and never got it done. This morning while I was zoning out at work a new tattoo popped into my head. It’s not something I was really considering, design or location wise, but it just feels SO DAMN PERFECT and all of a sudden I find that I can’t wait to get it. I know the responsible thing would be to wait and make sure this is really what I want, but I think I’m just going to say what the hell and do it this weekend. I actually ended up researching local tattoo places at work that day and getting the tattoo later that night. It’s the most impulsive thing I have ever done, I think. Nothing has ever felt so right. It has a deep meaning to me. First of all I love the poem, but there are a lot of poems I love and wouldn’t necessarily tattoo on my body… I love that line in particular because it speaks to me about the nature of love. There have been people in my life that I loved who caused me pain again and again. At one time I spent a lot of energy either beating myself up for loving them or trying not to love them at all. It became this weight I was dragging around, something I knew I needed to “fix” but didn’t quite know how. It was quite freeing when I finally learned that I can love someone and not allow them in my life. I can love someone and not allow their toxicity to pollute me. I can love someone without giving them control over how I am treated. I can love someone freely with my whole heart, my love not lacking in any way, and still choose what is best for me. There are people who, for whatever reason, genuinely love me but cannot participate in a healthy relationship with me. Instead beating myself up for things I cannot control, or feeling that my emotions were somehow “wrong,” I can look at the situation with a whole new perspective. I can let go and move on. It may or may not be what Pablo Neruda intended to say, but it is what I hear, it is what that passage means to me. Now this all sounds great, I learned something and now it is ‘known’ and life will be all cotton candy and unicorns, right? Well, not so much… Maybe other people are better at this than I am, maybe they can learn lessons like these and, like a light switch that is been turned on and they can now see. With me it’s less of a light switch and more of a skill set that must be practiced. Kind of a ‘use it or lose it’ situation. Sometimes I need to take a deep breath and remind myself that it’s okay to look out for my own needs. It’s okay to surround myself with people who don’t expect me to prove my love for them in painful ways. Nothing about my feelings are “broken” or “wrong.” In the moments that I’m struggling with that, all I have to do is look down and there it is written on my wrist. A reminder I take with me wherever I go. Fast forward to September 2009. I knew I wanted to get a second tattoo. Just like the first time I was carefully considering many things, even made a few decisions, but nothing felt right the way the Neruda quote did. I knew what I wanted this one to express, but not what I wanted it to say. I actually spent a few months looking up quotes online by subject, finding a lot of things I liked, a few things I loved, but never the one thing that I knew I would know when I saw it. I was at a Venice concert with a friend; we were sitting in the back instead of dancing at the front of the stage like usual… The band started playing an old favorite of mine, but it was like hearing it for the first time. My shiny new perspective changes things around me even when I’m not aware of it. Sometimes even I am surprised. to lose what you do / and find who you are” is probably my favorite line in the song. The lyric that grabbed me so abruptly though, was “look for yourself in the here and the now.” It was expressing exactly what I had been scouring the net looking at all those other quotes in hopes of finding. I remember stopping. Stopping singing, stopping “chair-dancing,” just stopping everything. I remember turning to my friend and telling her “That’s my new tattoo.” In a flash I knew, it just felt right, the same way my first tattoo had felt. I didn’t get the second tattoo as quickly as I had gotten the first one, the font and placement had to be perfect and I wasn’t satisfied until I found the magic combination. It was early October when I finally sat down in the tattoo artist’s chair. I call this one my “diagnosis tattoo” because the way the first tattoo was a direct result of growth due to a bad relationship, this one was a direct result of growth due to my diagnosis of Multiple Sclerosis. In many ways finally getting the MS diagnosis was a relief, but that’s a topic for a different post. The other thing my diagnosis did was really kick the-obsessing-over-the-future up a notch. I’ve always been a worrier. I can worry about anything. If you gave me a free mansion I could live in the rest of my life, I’d immediately start worrying about who was going to clean it and how I was going to pay the gardeners. It’s just a thing I do, I go to the worst-case-scenario in my head first thing and start trying to figure out how to deal with it. It makes me a great person to have around in case of an emergency, but it’s not conducive to happiness or calmness. It’s something I’ve known about myself for a long time. It’s something that can bring enormous positives to certain situations, I’m not saying it is a bad thing. I’m usually the most organized person in the room because of all the preparation I do trying to make sure things don’t go wrong, but it’s something I have to work to keep in check. Take a person who can’t stop worrying about things, tell them that they have a degenerative disease with no cure, then stand back and watch the implosion, it’s going to be impressive! Every person is different so every reaction is different, but in general there are only two directions to go, positive or negative. In researching MS I learned that a significant number of MS related suicides occur in the first year after diagnosis, presumably by people who are not yet experiencing any major quality-of-life issues. I’m no mental health expert, but I think those are people who are so focused on what might be coming down the line that they are trapped in a sort of cycle of despair they can’t get out of. As a worrier I totally understand that, but my instinctual reaction was sort of to take it in the opposite direction. Barring any miracle cures or revolutionary new treatments, MS doesn’t get better. The attacks often resolve themselves, yes, but it is a disease of cumulative damage. Think of coastal erosion, and think of a hurricane. When the hurricane passes things can get back to normal, but MS is still “eroding the coastline” by taking away the body’s function a small piece at a time. Over the years it adds up. I am now in a phase of the disease where I have a significant amount of damage that isn’t going to go away. It would be so easy to focus on that and obsess about what I will do when things get worse. I’m not going to lie, there are times when I still lay in bed and my brain spins ’round and ’round with possibilities, each one worse than the last, but those moments are few and far between. Mostly I look at it this way: my disease is just going to get worse. No matter how bad I feel today or how frustrating my level of disability, some day down the line I am going to look back on today and consider it the “good ‘ole days.” In the future I am not going to be able to do some of the things I can do today; it’s a fact. When that day comes, do I want to look back on today and regret that I wasted my time worrying and being unhappy, or do I want to look back and smile at how I enjoyed every minute as much as I could? It’s the same way that I can look back now and smile at the memory of dancing in the front row of a concert. I can’t dance in the front row anymore, but those memories still make me happy. I know you’ve probably heard “live for today” or “one day at a time” in one form or another many, many times. It’s one thing to hear it and say “yeah, yeah, sure, whatever.” It’s another thing to really know it in your head and your heart. Well, I know it now. My life is far from perfect, a few less challenges in life would certainly be welcomed, but if I stop and look around, really take in “the here and the now” my life is pretty damn good. I have things I am passionate about, I have so many wonderful people in my life, and even though my body doesn’t always do what I want it to do, I can still go walk up the block on a beautiful day and appreciate what I see. And on the days I’m having a little trouble remembering that, I only have to look down, I have a reminder written on my wrist. When I got my tattoos the tattoo artist (same person both times) wanted to make sure I understood that I was getting them upside down. I would easily read them, but other people would have a hard time. That’s ok, I told him. I got them to make myself happy. If you happen to think they are cool, I will smile and say thank you. If you don’t understand or like them, I’ll tell you that’s okay, tattoos are not for everybody. But the fact is that neither scenario makes a difference to me, my tattoos are for me and me alone. I can honestly say that I love them even more now than when I first got each of them. They are my reminders. They are the lessons that are so important to me, I need them to have a physical presence. They are my tattoos. This entry was posted in Life, Medical and tagged Art, Attitude, Concerts, Love, MS, Multiple Sclerosis, Music, Pablo Neruda, Poetry, Relationships, Songs, Tattoos, Venice, Worry on May 14, 2013 by Jennifer Kaplan. Someone recently said something to me that’s been on my mind for a while now. I was told I wasn’t really disabled. It was an offhand comment, but this person implied that if I truly wanted to I could somehow stop having Multiple Sclerosis. Or maybe I’d still have it, but there would be no symptoms… I’m not sure. They weren’t particularly clear about how it would work, but they were pretty clear in that it was a choice I was making and therefore my fault. I hope you never know. I hope you never know what it’s like to be in constant pain. Ever had a “charley horse?” Now imagine that never going away. Some days are better than others and on the very best days it’s merely annoying not debilitating, but it never goes away. And those good days are few and far between. I’m on enough painkillers to tranquilize an elephant* and still I’m in constant pain. I hope you never know what that is like. I hope you never know what the term “MS Hug” means. It’s not a medical term but say it to any MS patient and they will know exactly what you are talking about. The Boa Constrictor that has wrapped itself around your torso. King Kong holding the heroine so tightly she can’t breathe. I hope you never know what it feels like to sit very still hoping like hell the muscle relaxers start working soon and fighting for each breath. I hope you never know what it is to have your eyesight fail you (Optic Neuritis) or have problems hearing. I hope you never have to think about when places you need to go will be at their emptiest, because the more people there to bump into you means the more likely you are to fall in front of everyone. I hope you never have to plan ahead for “big” days like grocery shopping or laundry by not doing anything physical the day before and not being able to get out of bed the day after. I hope you never have to avoid places you love because there is nowhere to sit down if you need to. I hope you never have a day where taking a shower and putting clothes on is so exhausting you can’t do anything else. I hope you never know what a challenge it can be to type, write, put on earrings, put on clothes, brush your hair, etc. etc. and so on. I hope you never know the utter exhaustion you can feel, while still not being able to get any restful sleep. I hope you never know the terror that comes when you can’t control your own body. I hope you never know the hopelessness you feel when you can’t count on the one person who has never let you down before: yourself. This entry was posted in Medical and tagged Attitude, Disability, MS, Multiple Sclerosis on September 9, 2012 by Jennifer Kaplan. I’ve always wanted to go to New York. It’s been a dream of mine since, well, forever. It always looked so cool on TV and in movies, that image of the busy streets where you’re always on your way to or from something fabulous. As a lover of theater I don’t think I need to say anything else to explain why I wanted to go so badly. ‘Walk the streets of Manhattan’ was on my bucket list, but it didn’t seem very likely between my financial situation and my worsening Multiple Sclerosis. Then at the end of 2010 something magical happened, a particular blend of insanity/inspiration (depending on your point of view) mixed with the perfect circumstance to present me with a week in New York in February of 2011, and a traveling companion who would be both understanding and helpful if my health started to present challenges. I tried to make an effort to pay attention to photo opportunities while I was there, but I pretty much failed at that. And gladly so, I was very aware that this would in all likelihood be my only opportunity to explore New York and probably my last big trip anywhere. (Not in a morbid way, but in a way where I was very present in every moment and appreciative of where I was and what I was doing.) So in some strange way the fewer and worse the photos, the better my experience. I was too busy basking in it to bother to photograph it. This photo makes me outragously happy. I can’t articulate why. On this trip we learned I am NOT a good flyer. Not scared, just bored. REALLY bored! Even the soda says New York on it. A slice of actual New York Cheesecake in New York! Another of my favorite photos. …and adult beverages with breakfast! I still think about this meal. So yummy! I could have happily sat in this park all day. At the end of the week I was so sad to come home, but wow did my body need rest. It held up better than I had expected it to, but there were many things I just wasn’t able to do. Most disappointing to me was missing out on The Met. I made it through maybe one or two exhibits before I couldn’t walk any more. I just couldn’t make my body cooperate, and my pain levels were through the roof. (The only better friend on this trip than my traveling companion were my pain killers!) But even if I’d been in perfect health there just wouldn’t have been time to fit in everything I wanted to do. So many museums, plays, and experiences had to be scratched off the list to make room for other things. Going to New York is still a dream of mine. I’m sure it always will be. I want to go again, I want to go often, I want to go see all of the museums. (And the plays. All of them. Ever. And then start over again. ) Okay, so until I win the lottery or George Clooney marries me, it’s not going to happen. But the universe conspired to give me my trip. The universe surrounded me with people who gave me the very best advice on what to see and do, and shaped the experiences I had. I had no way to know it at the time, but the universe sent me there right before my ability to walk took a drastic downturn. It really ‘the perfect storm’ in the very best of ways. I doubt I’ll ever be able to go back, but I still treasure the memory of my once-in-a-lifetime week in New York. This entry was posted in Life, Medical, Photography and tagged Arches, Architecture, Bucket List, Cell Phone Photography, Central Park, City Views, Desserts, Food, Health, Logos, MS, Multiple Sclerosis, Nature, Neon Signs, New York, Photography, Signs, Sky, Skyline, Statues, Travel, Trees on February 28, 2011 by Jennifer Kaplan.